Going by what your ears tell you, you’d have to be forgiven for guessing wrong at mood-metal three-piece Deathwhite‘s base of operations. Sweden? Nope. The UK? Nope. Poland? Nope. Romania? Nope. Some frigid former Soviet Bloc nation with little scene to speak of but plenty of passion and sadness to spare? Wrong-o, chief. The correct answer is Pittsburgh, Pennsylvania. Steel City. 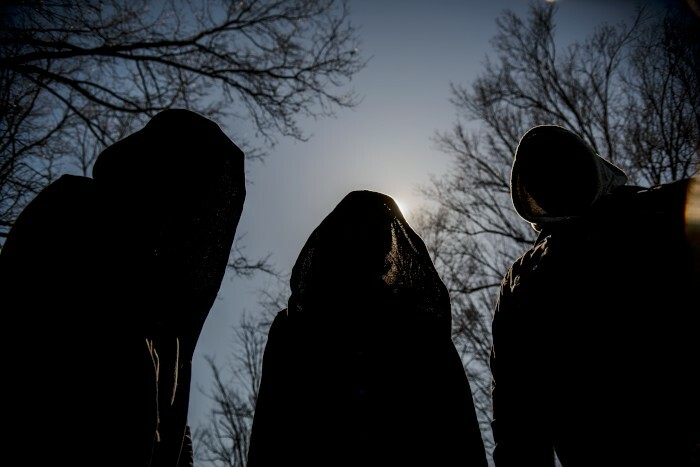 The trio choose to remain anonymous under their hooded robes — I’ve seen AM and LM listed as a partial lineup, so maybe there’s a pair of brothers in there, but maybe not — but when it comes to their debut album for Season of Mist, the nine-song/43-minute For a Black Tomorrow, their intention couldn’t be clearer. The mission of the album, front to back, is to pay homage to the greats of melancholic metal. Perhaps Katatonia, and in particular the Last Fair Deal Gone Down era of that Swedish outfit’s work, most of all, but definitely the oeuvre of the so-called ‘Peaceville Three’ — My Dying Bride, Paradise Lost and Anathema — as well. Saying that might lead one to believe there are death-doom elements at play throughout For a Black Tomorrow, or that the band engages a rawness of production à la those groups’ transformative works in the early ’90s — a specific aspect I’d argue just about no one has been able to accurately recreate — but no. Deathwhite take on the atmospheric, emotional, and melodcally ranging side of these bands’works, and while tracks like the later “Death and the Master” offer some shouts and heavier thrust, and amid one of the album’s strongest hooks, the earlier “just Remember” proffers a riff with a sharper bite than that of, say, opener “The Grace of the Dark,” which unfolds at the beginning of Deathwhite‘s first album with a patience that immediately puts the band in command of both the aesthetic and the outward-moving progression of the LP itself. In other words, there’s an awful lot about what they want to do that Deathwhite have already figured out. The band has two prior EPs in 2014’s Ethereal and 2015’s Solitary Martyr, but while I obviously have no confirmation to back me up, I’d more likely credit their cohesiveness as regards overall mission to members’ prior experience in other outfits. Do I know that? Nope. But though Deathwhite have been together for upwards of six years, there are still parts of For a Black Tomorrow that speak to pedigree beyond this band itself. The fluidity with which “The Grace of the Dark” unfurls atop double kick drums, building tension in its verse to release in the chorus, or how the subsequent “Contrition” picks up with a more urgent and metallic chug topped with a plotted but classy lead that fades out of the mix just as the first verse begins, the band galloping forward for the duration into the depressive acoustic/full-breadth tone trades that take place in “Poisoned,” a swapping out of layers masterfully handled by producer Shane Mayer that only make the fullness of tone in the subsequent “Just Remember” all the more resonant. That song, along with the following centerpiece “Eden,” might be the emotional and aesthetic crux of For a Black Tomorrow — i.e., the moments at which Deathwhite‘s tribute is most readily paid to their influences. Once again, that’s primarily directed toward Katatonia, but there are darker impulses at work as well, in the guitar and bass tones, though the vocals and the pacing assure that the prevailing vibe is emotionally downtrodden in just such a specific way. It’s also gorgeous — especially “Eden” — so another manner in which Deathwhite seem to nod to their stylistic forebears is finding beauty amid the darkness of their making and not forgetting to highlight the one alongside the other. That, ultimately, is a major factor in what separates this kind of doom from its more workmanlike, traditionalist contemporaries. It’s not until they come around to sixth track “Dreaming the Inverse” that Deathwhite cross over the five-minute mark. One could argue this shows a monotony of structure, but that’s simply not the case — rather, it’s an efficiency of songcraft from which the trio begin to branch out as For a Black Tomorrow progresses toward its finale title-track. After “Eden,” “Dreaming the Inverse” (5:01) brings turns between double-kick gallop and quieter, brooding verses, the sudden moves between one and the other a familiar tactic and not entirely dissimilar from what Deathwhite already brought to “Poisoned,” though heavier on the whole and more soulful vocally. That vocal soul sets up the primary impression that “Death and the Master” will make over the course of its six and a half minutes, as a rawer shout — still melodic, but the delivery changes, to be sure — emerges to top the fuller push of the band behind it. As one of the most engrossing moments of For a Black Tomorrow, “Death and the Master” takes on a declarative vibe that could be derived from Primordial at least in part or perhaps unintentionally, but it’s a powerful standout either way, and though an interlude of some sort might’ve worked well to separate the two, “Death and the Master” still doesn’t necessarily overshadow “Prison of Thought,” which follows, the two songs rather acting as complements as the latter revives shifts from hard-driving distortion and acousti-poetics, settling by its finish on a raucous but still very much controlled payoff. “For a Black Tomorrow” itself rounds out, the band quickly dropping a lyrical reference to Anathema‘s “Shroud of False” from Alternative 4, and moving through a return to the shorter songcraft of earlier pieces, but with something of a looser feel as the guitar leads the way through. There’s still a tension in the chug, but open-ringouts remind of the patience in “The Grace of the Dark,” and the vocal harmonies that top the final section before the fadeout in the song’s second half are nothing less than beautiful. One could hardly ask for a more appropriate ending. 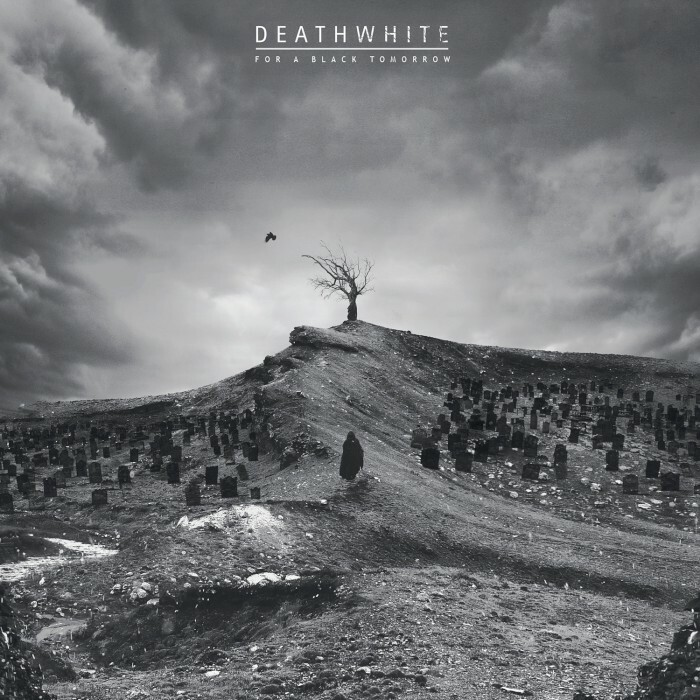 What Deathwhite present on their debut album is a powerful showcase of aesthetic. They prove readily in these tracks that they know what they want to sound like, know where they’re coming from in terms of influence and style, and know how they want to bring that to fruition in their own work. As the question was eventually put to the likes of Anathema, Katatonia, Paradise Lost and My Dying Bride, sooner or later, Deathwhite will have to answer how they’ll be able to take these elements and craft something more individualized from them — that is, something to distinguish them from their forebears in the subgenre — but that is perhaps best left to time and the natural development of the group over their next however-many releases. As regards For a Black Tomorrow, it speaks with resonance to a certain depression of spirit and though Deathwhite may seem a novelty at first for the simple fact of their surprising geographic locale, there’s nothing in these nine songs that feels like a put-on or a less than genuine expression on its own level. This entry was posted	on Thursday, February 22nd, 2018 at 10:34 am	and is filed under audiObelisk, Reviews. You can follow any responses to this entry through the RSS 2.0 feed. You can leave a response, or trackback from your own site. There goes another 0.380 seconds.